Erick Greene and his team employ “roboraptors”—taxidermied hawks and owls with robotic moving parts—to learn about how birds communicate with alarm calls when a predator is nearby. Video by Chris Foito/Cornell Lab Multimedia. The woods are wiretapped. Everywhere eyes are watching. And the moment a Black-capped Chickadee sees something to be concerned about—say the slim silhouette of a Sharp-shinned Hawk perched in a tree—a rapid-response network kicks into action. Chick-a-dee-dee-dee! The alarm call ricochets from chickadees to nuthatch­es to titmice to jays, and soon an angry horde of songbirds arrives to mob the intruder. Even after the sharpie gives up and flies off, the alarm call network keeps buzzing with a wave of real-time reports that the threat is now on the move. This new information can trav­el at speeds exceeding 100 miles per hour, giving birds advance warning to take cover. After 10 years of studying alarm calls, University of Montana research­er Erick Greene says it’s a wonder predators ever beat the system. Greene was part of a team that made newspaper headlines in 2005 with a paper in the journal Science that decoded the chick-a-dee alarm call of Black-capped Chickadees. They found that the number of -dees in a call cor­related with the threat posed by a pred­ator. More -dees mean a higher threat. So a Northern Pygmy-Owl (which specializes in hunting small birds) elic­ited a string of –dees from chickadees, sometimes as many as 12. Now Greene is teaming up with Chris Clark of the Cornell Lab of Or­nithology’s Bioacoustics Research Program and Mike Webster of the Macaulay Library on a National Sci­ence Foundation-funded project to delve even deeper into the complex communications that are alarm calls. Greene and his team are finding that different alarm calls can have specific meanings—that alarm calls are actu­ally a spoken language among birds, and several species understand what’s being said. In some experiments, Greene and his team play audio recordings of dif­ferent species’ alarm calls near bird feeders and observe how the birds react. In others, the researchers em­ploy roboraptors—taxidermied hawks and owls with robotic moving parts. On a sunny spring day last May at the Cornell Lab’s Sapsucker Woods head­quarters in Upstate New York, Greene pressed the button on a modified ga­rage door opener to drop a cloth cur­tain and reveal an animatronic Eastern Screech-Owl. Left to right, the robo­raptor slowly swiveled its head (not un­like the mechanical children at Disney World who sing “It’s a Small World”). A pair of Tufted Titmice descended down the boughs of a nearby tree immedi­ately, scolding all the way. Chickadees soon joined the protest to take turns dive-bombing the owl until the curtain went back up and the show was over. All the while, an array of microphones hidden in the underbrush captured ev­ery uttered sound, adding to Greene’s storehouse of alarm-call data. Taxidermist Eugene Streekstra works on building a robo-raptor in his workshop near Missoula, Montana. Here he puts the finishing touches on a robo-screech-owl. Photo by Jeremy Roberts, Conservation Media. Of Greene's seven roboraptors, the smallest ones elicit the most fervent alarm responses from chickadees, such as his robo-Northern Pygmy-Owl. Photo by Jeremy Roberts, Conservation Media. Eric Greene holds a robo-Northern Pygmy-Owl. The roboraptors are hidden behind a camouflage cloth until it’s showtime and the cloth drops to reveal the threat. Photo by Jeremy Roberts, Conservation Media. At an experiment conducted in Ithaca, New York, a Tufted Titmouse was the first to spot and sound the alarm about the appearance of an Eastern Screech-Owl roboraptor. Photo by Tim Gallagher. Listen to an excerpt from the story about Erick Greene’s Alarm Call project, featured in the NPR/Lab of Ornithology series Close Listening: Decoding Nature Through Sound, heard on NPR’s Morning Edition. Back on his home turf near Mis­soula, Montana, Greene and his team are analyzing the spectrograms of thousands of alarm calls in audio labs. When Greene and graduate student Alexis Billings took a closer look at the harsh, guttural wah-wah-wah mob­bing calls of Steller’s Jays—meant to intimidate a robotic Northern Gos­hawk—they noticed that these were loud, harsh, large-bandwidth sounds. In other words, sounds designed to travel far and wide and be very easy to locate. Greene says these kinds of calls are given for a stationary threat, such as a perched raptor. More than 50 different species will respond to a chickadee’s alarm call. The woods are wired by these alarm call networks, which allow various species of birds and small mammals to exchange information about a hawk or an owl. In the East and the West, the specific members of the alarm call network may differ but the acoustic properties of how alarm calls are transmitted are similar. Photos (from top to bottom): White-breasted Nuthatch by Kirchmeier, Blue Jay by Larry Eiden, American Red Squirrel by Guy Lichter, Tufted Timouse by Deborah E. Bifulco. On the other hand, Greene has re­corded alarm calls that sound like seet-seet-seet and have a different meaning. Seets are high-pitched calls given when a raptor is in flight. For the raptor, it’s hard to tell where these sounds are coming from. But small birds hear it and know immediately what to do—duck into cover or freeze. 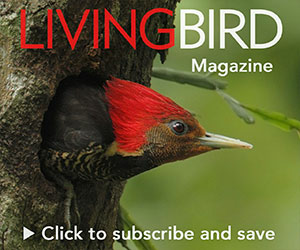 In one ex­periment in Montana, a peripatetic Red-breasted Nuthatch was observed bouncing around feeder to feeder, but then Greene broadcast a snippet of seet calls lasting a single second. Instantly the nuthatch froze in place, seed in its bill, and stayed that way—an ornamen­tal bird statue—for half an hour. Because seet calls are higher frequency than mobbing calls, they don’t transmit as far. And yet, the message still moves quickly throughout the woods, thanks to a rapid-relay system. Think of the old-time bucket brigades used to put out a fire. In experiments using extensive networks of microphones placed every 50 meters—covering the acoustic landscape, as Greene says—he has recorded seet calls re­layed across several different species, from Black-capped Chickadees to Lazuli Buntings to House Finches to Song Sparrows. The microphone array clocked the alarm signal traveling up to 100 mph from an initial point to 200 meters away (about the length of two football fields). A roboraptor is placed behind camouflage cloth. Photo by Jeremy Roberts, Conservation Media. Dr. Greene discusses his alarm calls project. All seet calls are in the same frequency range. Other research has shown that Australian fairywrens will flee in response to the seet calls of species they’ve never heard before. Greene has documented that even red squirrels and chipmunks can understand the meaning of seet calls, and vice versa—the alarm squeaks of red squirrels elicit a take-cover response among chickadees. “It’s the universal language of ‘look out!’” says Janelle Morano, a Cornell Lab researcher who’s coordinating the experiments in Ithaca, New York. Morano says she was amazed the first time she lowered the curtain to reveal a robotic owl at a backyard bird feeder. She was doubly amazed when she got back into the Macaulay Library studio and downloaded the record­ings for analysis. The chorus of alarm calls had ballooned from a few birds to more than 20 individuals. In just 5 minutes, she had recorded more than 800 chickadee call notes alone. “There’s so much data to be ana­lyzed every time an alarm call goes out,” she says.